The holidays are a wonderful time to visit New York City. From Macy’s dazzling window displays to the Rockefeller Center Christmas Tree, NYC knows how to shine bright this time of year. 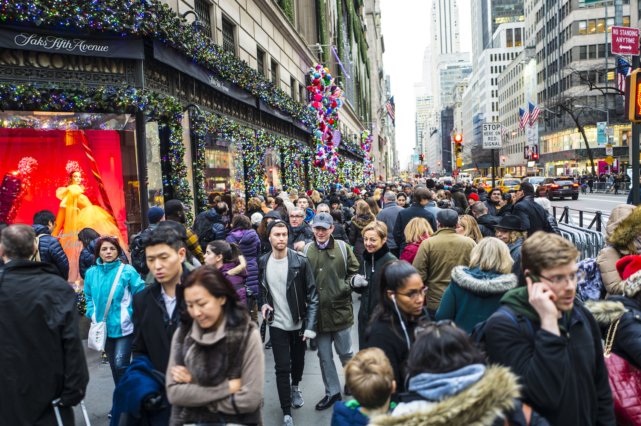 But for New Yorkers, the holiday season can feel like a holiday stampede. Who knew so many people could fit in one space? It’s incredible to think that 5 million people visit NYC between Thanksgiving and New Year’s. Talk about a crowd! Want to outsmart the tourists? Here are some tricks we’ve learned through the years as a messenger company in NYC. Taking even one look at the holiday crowd can cause your heart to race. If you plan to visit any tourist attractions this year, save yourself stress and go during the off-hours. The least-crowded times are either early morning or late at night. This year, the Rockefeller Christmas Tree will be lit from 5:30 a.m. to 11:30 p.m. through Jan. 7. Rather than fighting the crowds on a weekend afternoon, go right before the tree is illuminated for the day or catch a glimpse late at night before the tree goes dark. If you’re traveling in the city, take the subway instead of a taxi. Visit restaurants when they’re less busy—around 2 p.m. and after 8 p.m. Also, be sure to make reservations whenever possible. Avoid Fifth Avenue at all costs. Take advantage of online shopping. If you walk the same way to work every day, see if there are any shortcuts. Many Times Square hotel lobbies connect streets and allow you to avoid crowds. The secret to a stress-free season is planning ahead. If you want to enjoy a nice dinner out, make reservations well in advance. If you want to have gifts delivered on time, plan ahead with your preferred delivery company. Learn how else you can save with holiday deliveries, here. We’re On the Way—Please Be Patient! We understand the traffic can be frustrating. During this time, we ask that you please be patient as our drivers and couriers maneuver the city streets. We have the best technology at our disposal and will do everything we can to reach you and your customers in a timely manner. Need to schedule rush delivery in NYC? Share some details with our team and then request a quote online. For more information regarding holiday deliveries or to speak with a representative, call RDS at 212.260.5800 or contact us online today.